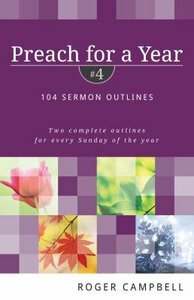 Preach for a Year #4 provides the busy pastor or teacher with 104 sermon outlines, enough for two sermons every Sunday of the year. These outlines are biblical-a complete Scripture index leads preachers to specific Bible passages. These practical and easy-to-use outlines are each structured in three steps. The first section is the Introduction which provides attention-getting thoughts for sermon starters. The Body follows with several alliterated points of biblical exposition. The third section is the Conclusion which suggests practical questions and devotional thoughts for application. Here is a complete and comprehensive resource to help you preach the Word for an entire year. About "104 Sermon Outlines (#04 in Preach For A Year Series)"
Order now to secure your copy when our stock arrives. Other edition is available. 9780825426759 0 Available. Expected to ship in 5 to 6 weeks from Australia.